2,262 stock photos, vectors, and illustrations are available royalty-free. 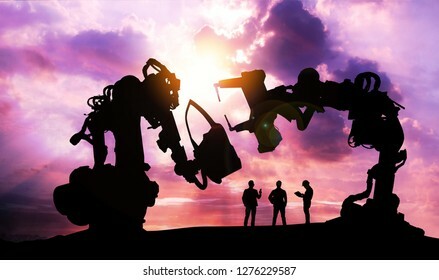 Silhouette of business man command automation robot arm machine technology , industry 4.0 , artificial intelligence trend concept. Sunrise twilight background. 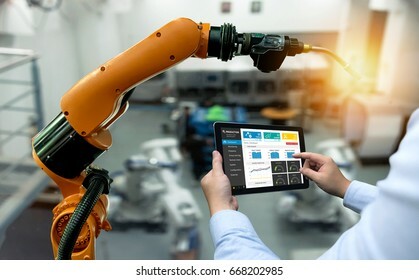 Process Control room and Industrial Automation in industry 4.0 technology trend concept. 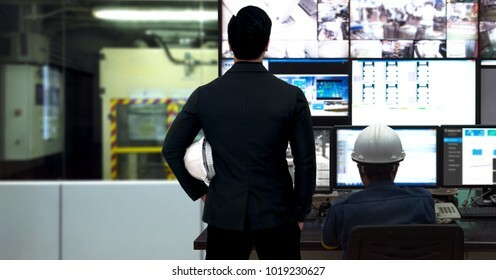 Engineer and director manager monitoring real time work automation machine process in smart factory. 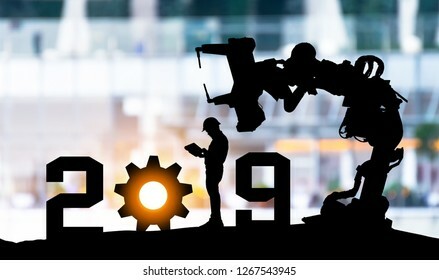 2019 years of robot assistant technology , industry 4.0 , artificial intelligence trend concept. 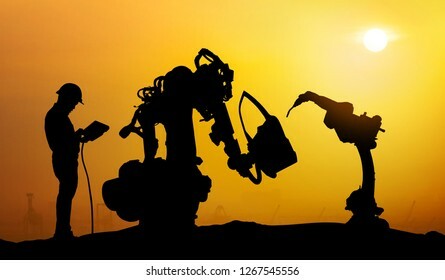 Silhouette of business man control automation robo advisor arm with sunrise logistic bakckground. 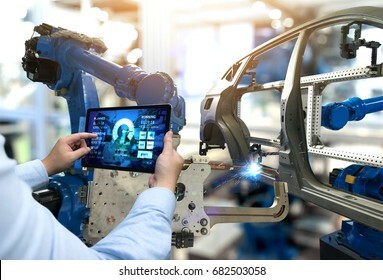 Industrial internet of things , disruption technology and industry 4.0 concept. 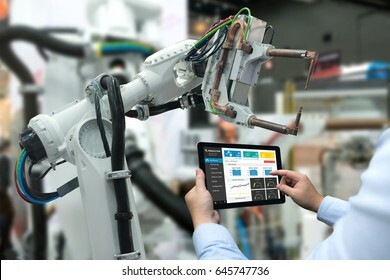 Double exposure of automate wireless Collaborative robot arm for control and monitoring system in smart factory. Machine Learning analytics identify person technology , Artificial intelligence ,Big data , iot concept. 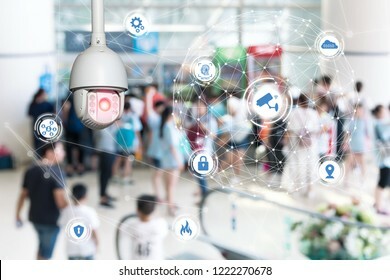 Cctv , security camera and face recognition people in smart city building. Artificial intelligence in smart healthcare hospital technology concept. 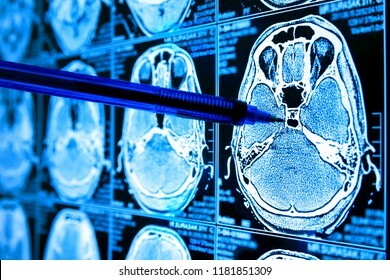 Doctor point pen to AI biomedical algorithm screen and machine learning detect brain Pneumonia , cancer cell in X-Rays process. 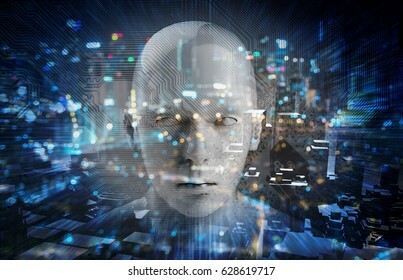 Smart health care internet of things and hospital automation management , Artificial intelligence hologram robot adviser technology concept. Doctor with Stethoscope using tablet for remote monitoring. 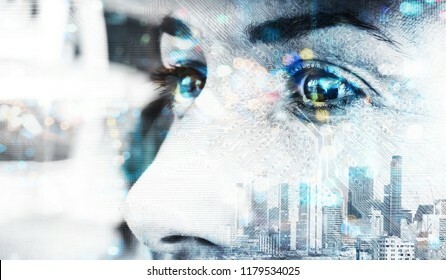 Digital transformation disruption every industry technology , artificial intelligence biometric retina eye scan for security technology concept. 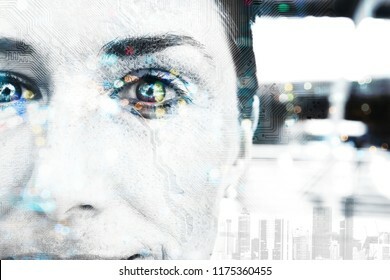 Double exposure of female face and circuit board. Industrial 4.0 Cyber Physical Systems concept . 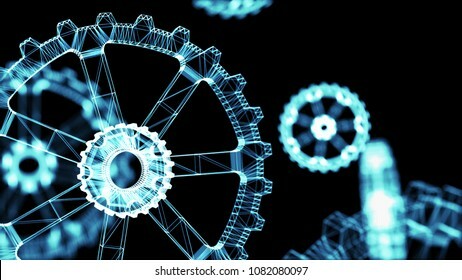 Wireframe Gears with black background. 3d rendering. 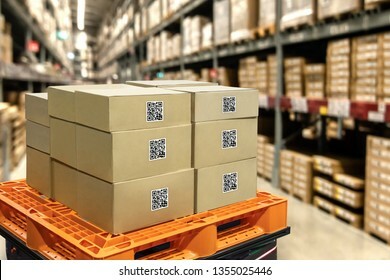 Smart logistic industry 4.0 , QR Codes Asset warehouse and inventory management supply chain technology concept. 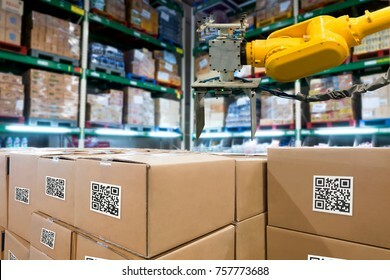 Group of boxes and Automation robot arm machine in storehouse. 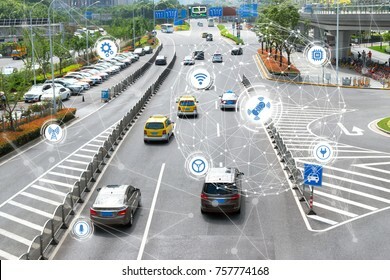 Smart car (HUD) , iot , Autonomous self-driving mode vehicle on metro city road iot concept with graphic sensor radar signal system and internet sensor connect. Artificial intelligence in smart healthcare hospital technology concept. 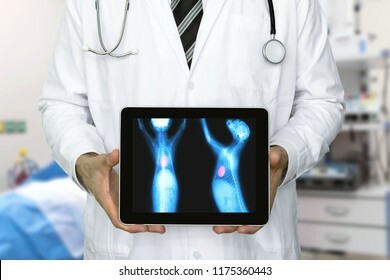 Veterinarian doctor use AI biomedical algorithm detect heart disease , cancer cell in dog with digital filmless X-Rays process. 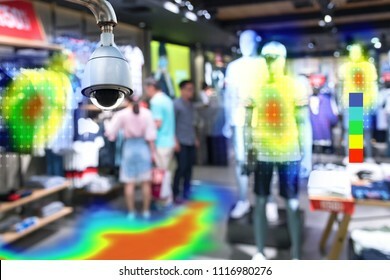 Heatmap Analytic in smart fashion retail shop technology concept. 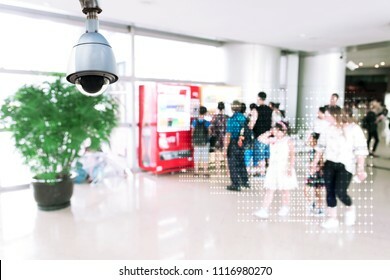 Artificial intelligence cctv of security camera with heat sense application check shoppers passed from any point in store. 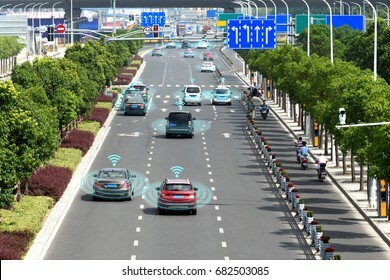 Smart car (HUD) , iot , Autonomous self-driving mode vehicle on metro city road iot concept with graphic sensor radar signal system and internet sensor connect. Blue tone image. 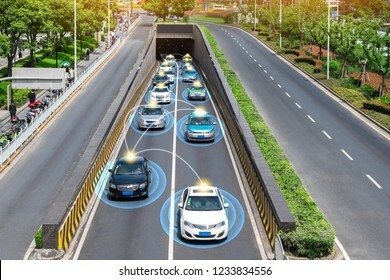 Machine learning analytics identify vehicles technology , Artificial intelligence concept. Software ui analytics and recognition cars vehicles in city. 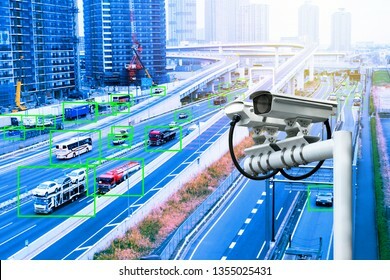 Smart surveillance cameras. 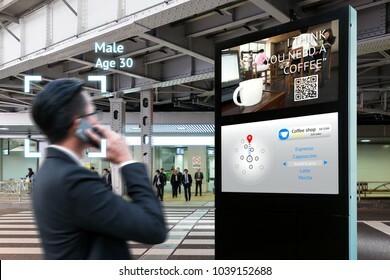 Intelligent Digital Signage , Augmented reality marketing and face recognition concept. 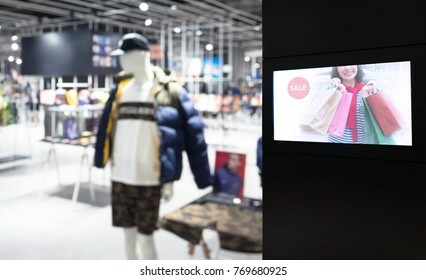 Interactive artificial intelligence digital advertisement in fashion retail shopping Mall. 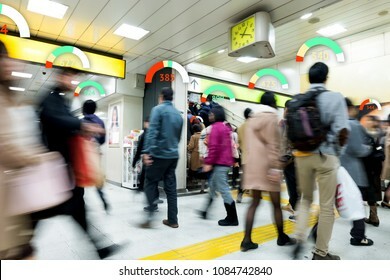 Personal social credit score. 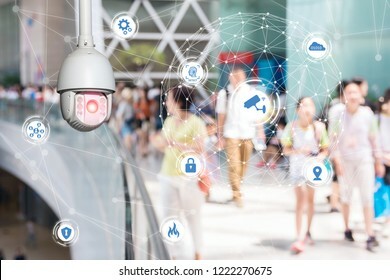 Machine Learning analytics identify person technology,Artificial intelligence no privacy security camera technology concept. Software ui analytics and recognition people. 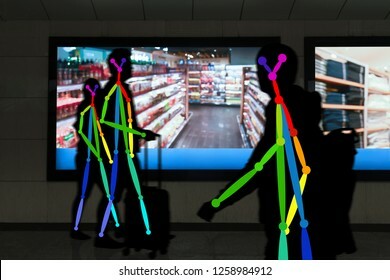 Intelligent Digital Signage , Augmented reality marketing and face recognition concept. 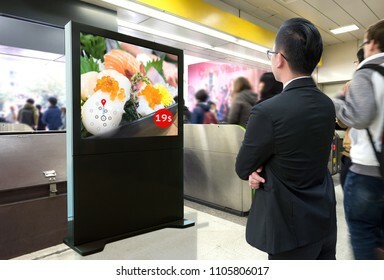 Interactive artificial intelligence digital advertisement sushi Japanese restaurant in subway or sky train. 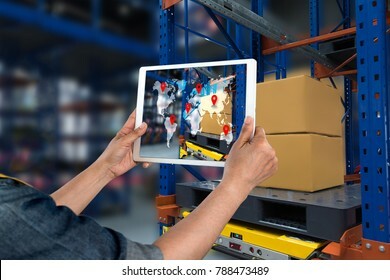 Smart logistic industry 4.0 , QR Codes Asset warehouse and inventory management supply chain technology concept. 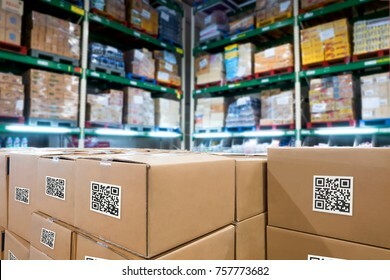 Group of boxes in storehouse can check product inside and order pick time. 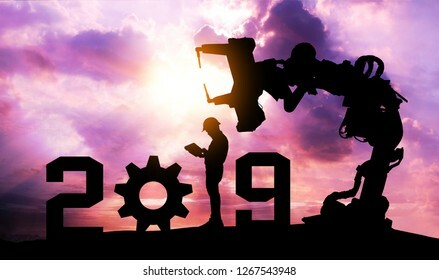 2019 years of robot assistant technology , industry 4.0 , artificial intelligence trend concept. 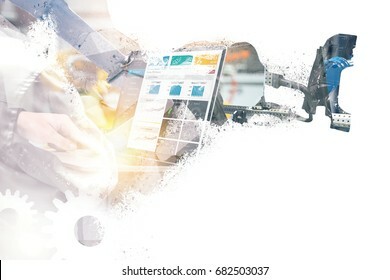 Silhouette of business man control automation robo advisor arm in blur smart building bakckground. 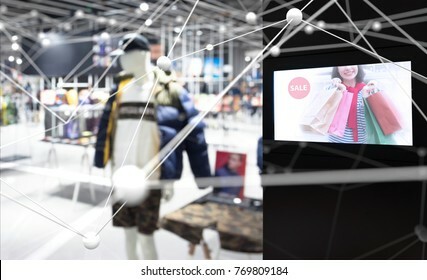 Smart retail internet of things , chatbot , online shopping technology trend concept. 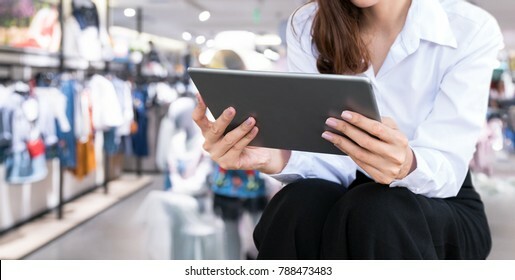 Female worker using tablet and blur retail shop background. 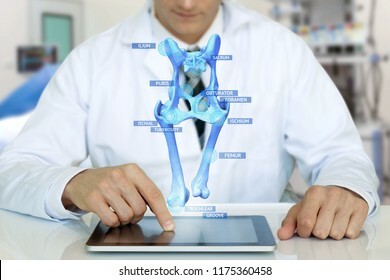 Smart health care internet of things and augmented reality education , Artificial intelligence hologram bone bone structure technology concept. 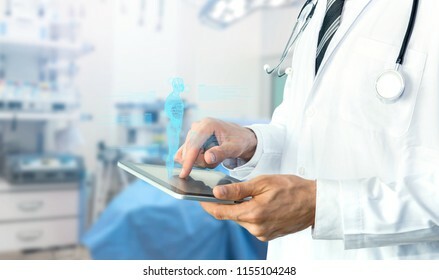 Doctor using tablet with ar application popup screen. Smart precision healthcare technology , artificial intelligence concept. 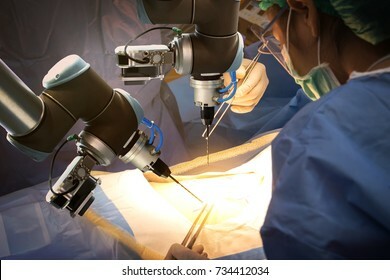 Automation robot hand machine in operating room and surgery doctors in futuristic hospital. 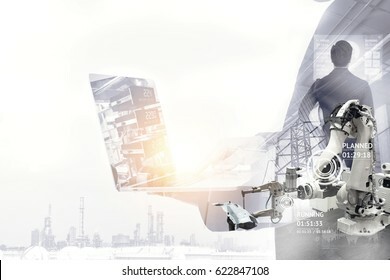 Industrial 4.0 , Augmented reality and smart logistic concept. 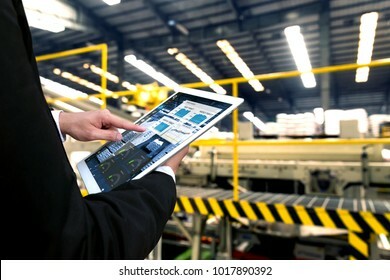 Hand holding tablet with AR application for check order pick time around the world and supply chain in smart factory background. Trade war tariffs. 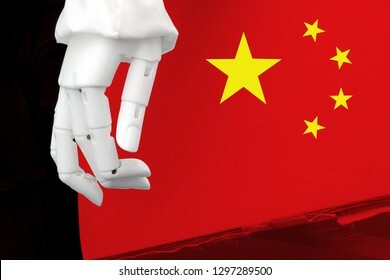 China artificial intelligence disruption everything industry 4.0 in global race ai dominance , neural network , deep learning concept. Flag on box and robot hand. Artificial intelligence in smart healthcare hospital technology concept. 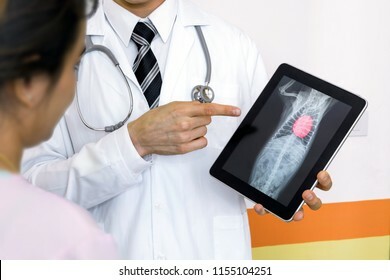 Professional doctor use AI biomedical algorithm detect enlarged heart disease of pets with digital filmless X-Rays process. Machine Learning analytics identify person technology , Artificial intelligence ,Big data , iot concept. 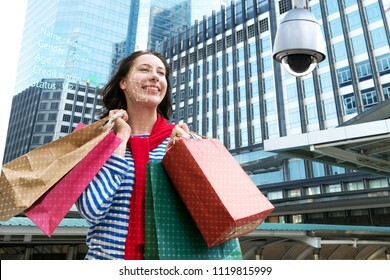 Cctv , security camera and face recognition people in smart city retail shop. 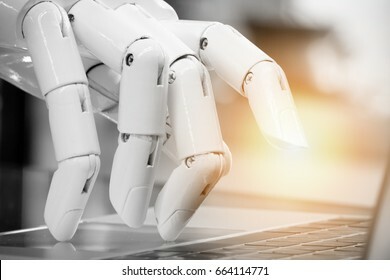 Robotic , artificial intelligence , robo advisor , chatbot concept. Robot finger point to laptop button with flare light effect. 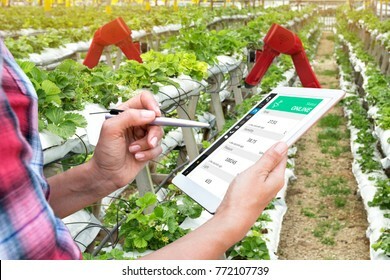 Engineer hand using tablet with machine real time monitoring system software. 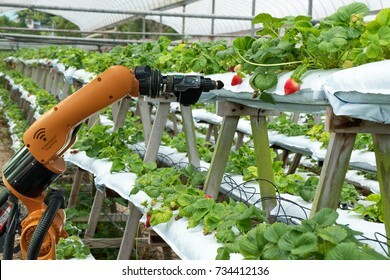 Automation robot arm , conveyor belt machine in smart factory industry 4th iot , digital manufacture. Quantum computer technology concept. 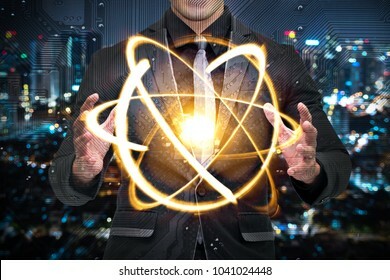 Man in suit holding science yellow shining cosmic atom nuclear. 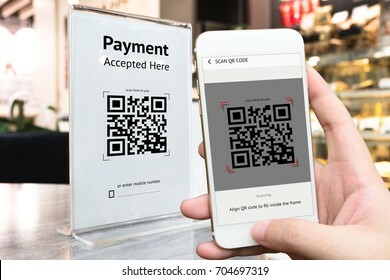 Qr code payment , online shopping , cashless technology concept. 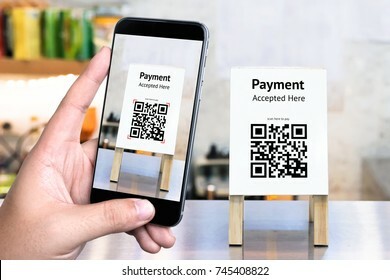 Coffee shop accepted digital pay without money , plastic tag on table and hand using mobile phone application to scan qr code. 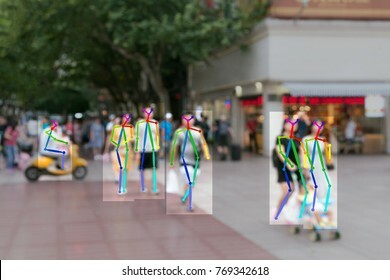 Augmented reality marketing technology concept. 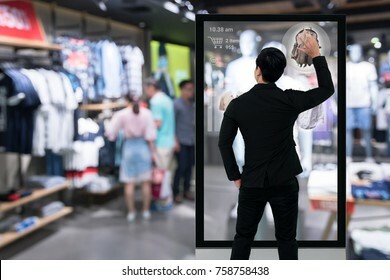 Businessman using smart glass digital signage , AR application to select and buy items in retail fashion shop. 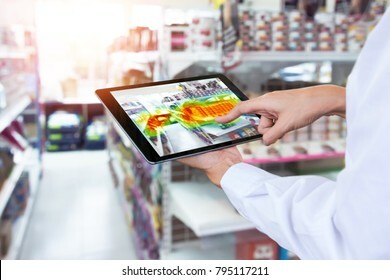 Heatmap Analytic in smart retail shop technology concept. Hand using smart tablet with Pheat sense application check shoppers passed from any point in store. 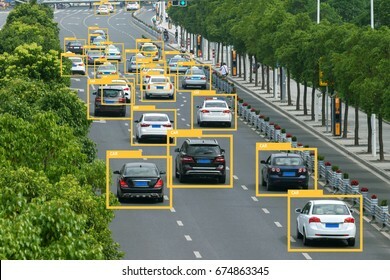 Machine Learning analytics identify behavior recognition technology , Artificial intelligence concept. 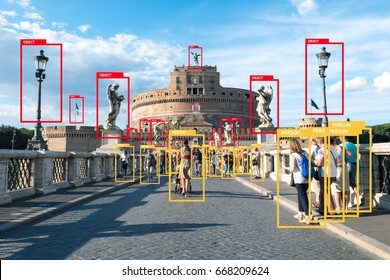 Software ui analytics and recognition people in smart city with image processing with camera. 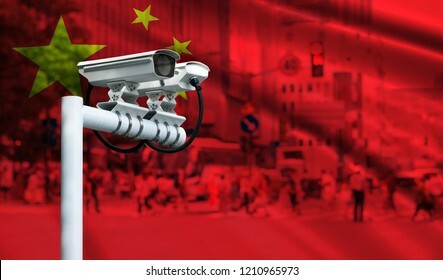 Smart surveillance cameras help automatically track identify almost every move in China. 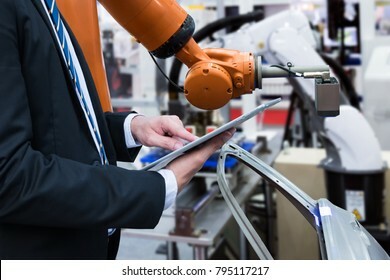 Robot assistant technology , industry 4.0 , artificial intelligence trend concept. 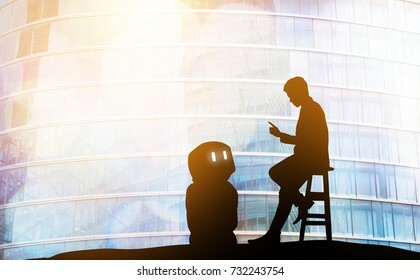 Silhouette of business man talking to automation robo advisor. Bokeh flare light effect with building background. 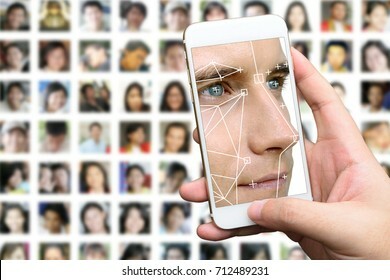 Machine Learning analytics identify person technology , Artificial intelligence concept. 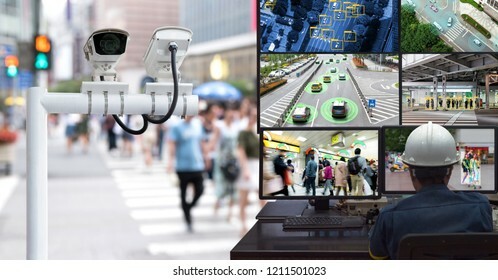 Cctv , security camera and biometric technology analytics behavior and face recognition people in smart city. 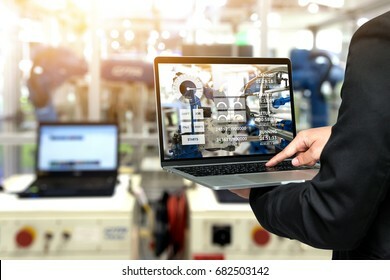 Male manager hand laptop for check real time production monitoring system application in smart factory industrial. 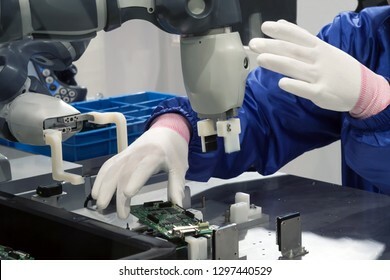 Automobile manufacturing production machine , robot arm. 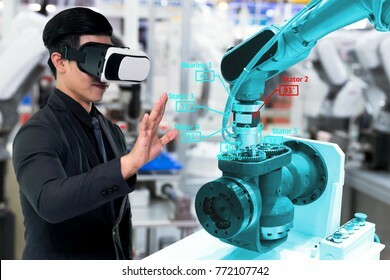 industry 4.0 concept. 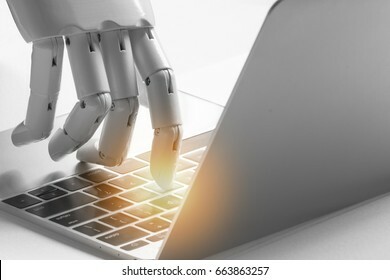 Artificial intelligence , robo advisor , chatbot , robotic concept. Robot finger point to laptop button with flare light effect. Machine learning analytics identify vehicles technology , Artificial intelligence concept. 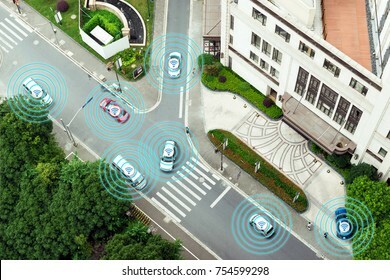 Software ui analytics and recognition cars vehicles in city. 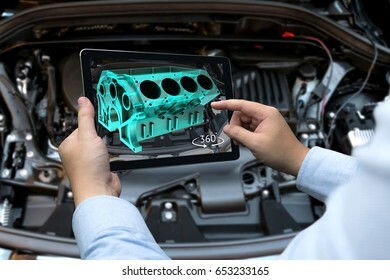 Digital transformation Trends in automotive industry. Smart car , Autonomous self-driving mode vehicle on metro city road iot concept with graphic sensor radar signal system , internet sensor. 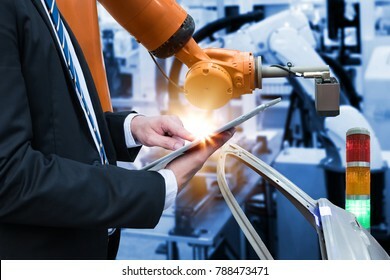 Robot assistant technology , industry 4.0 , artificial intelligence trend concept. 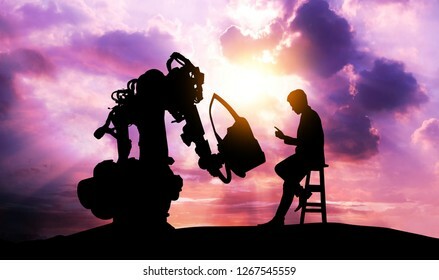 Silhouette of business man talking to automation robo advisor arm. Bokeh flare light effect with sunrise background. 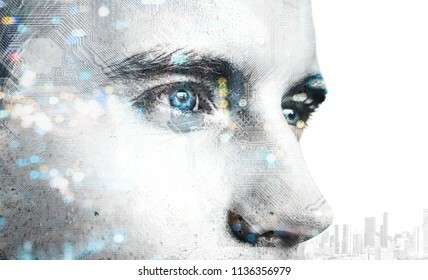 Machine Learning analytics identify person technology , Artificial intelligence concept. 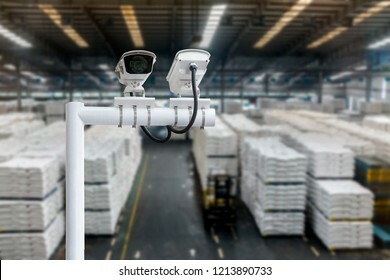 Cctv , security camera and Software ui analytics behavior and face recognition people in smart factory. Cyber communication and robotic concepts. 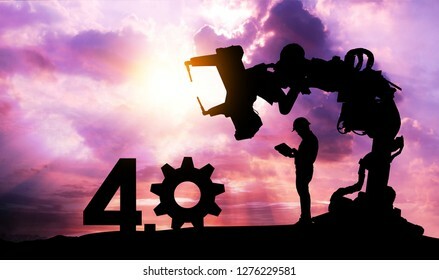 Industrial 4.0 Cyber Physical Systems concept. 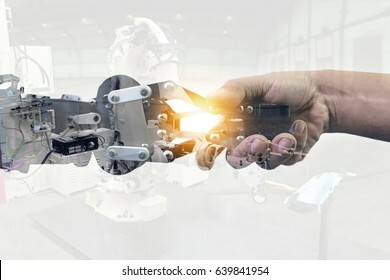 Double exposure of Robot and Engineer human holding hand with handshake and automate robot arm background. 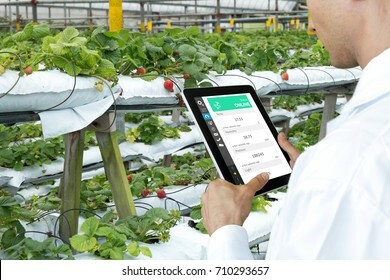 Smart indoor farm , Photoperiodism growth light for plants concept. 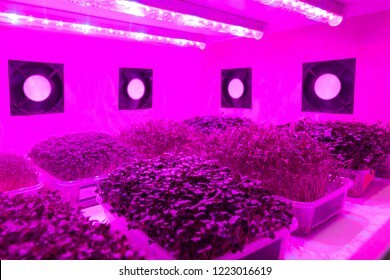 Artificial LED panel light source used in an experiment on vegetables plant growth. 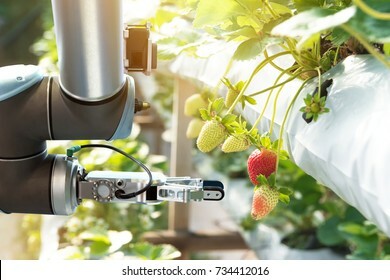 Robotics Trends technology , smart retail business concept. 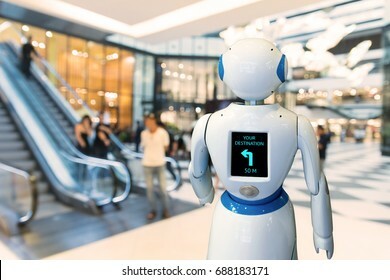 Autonomous personal assistant robot for navigation customer to search items in fashion shopping mall. 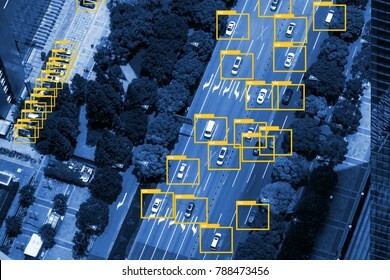 Machine learning analytics identify vehicles technology , Artificial intelligence concept. 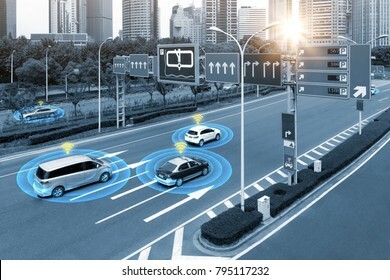 Software ui analytics and recognition cars vehicles in city. Bird eye view and blue tone image. Internet of things Disruption everything , neural network , deep learning , artificial intelligence concept. 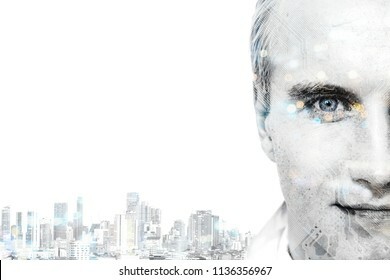 3d rendering of robot face , blue bokeh and building abstract background. Artificial intelligence in smart healthcare hospital technology concept. 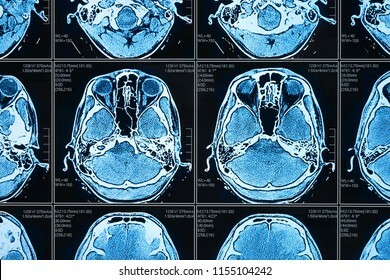 AI biomedical algorithm and machine learning detect brain Pneumonia and cancer cell in X-Rays process. 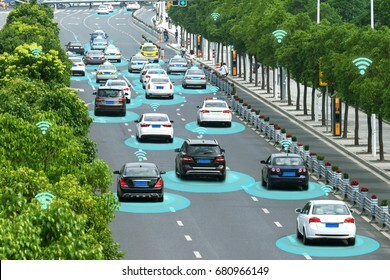 Smart car , Autonomous self-driving mode vehicle on metro city road iot concept with graphic sensor radar signal system and internet sensor connect. 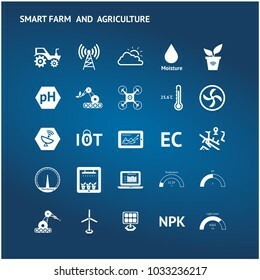 Smart agriculture, precision farm , UAV , sensor technology trend concept. White icons set on blue background. 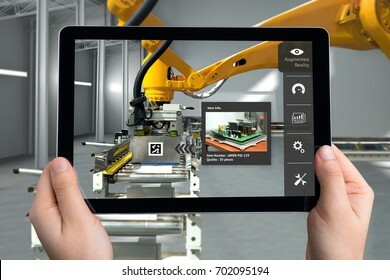 Industrial internet of things , disruption technology and industry 4.0 concept. 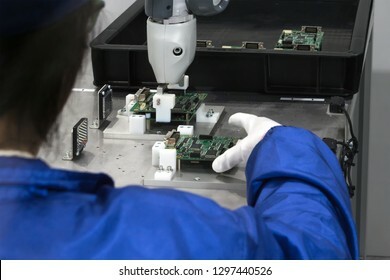 Double exposure of automate wireless Robot arm and man using laptop for control and monitoring system in smart factory. 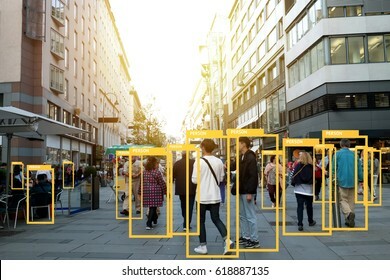 Machine Learning analytics identify person technology , Artificial intelligence concept. 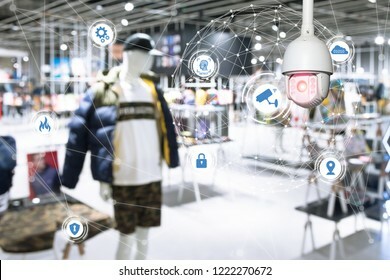 Cctv , security camera and Software ui analytics behavior and face recognition people in smart retail store. 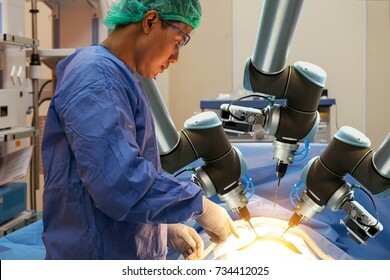 Artificial intelligence in smart healthcare hospital technology concept. 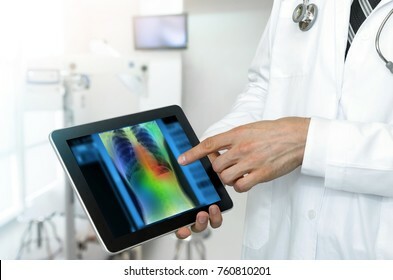 Professional doctor use AI biomedical algorithm detect Pneumonia and cancer cell in digital filmless X-Rays process. 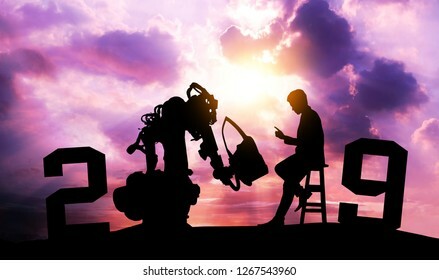 Silhouette of business man command automation robot arm machine technology , industry 5.0 , artificial intelligence trend concept. Sunrise twilight background. Chatbot , artificial intelligence , robo advisor , robotic concept. Robot finger point to laptop button. Data scientist , big data , artificial intelligence , machine learning technology concept. 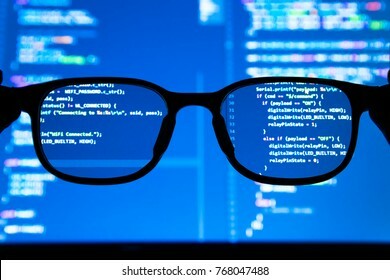 Silhouette glasses in front of laptop computer screen with programming coded. 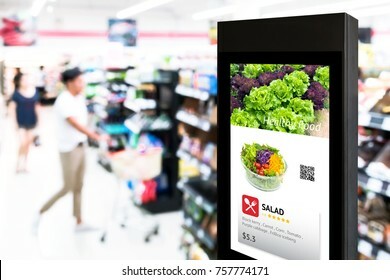 Smart retail , robot assistant , robo advisor navigation robot technology in department store. 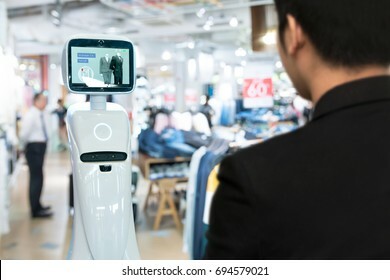 Robot walk lead to guide customer to destination target. 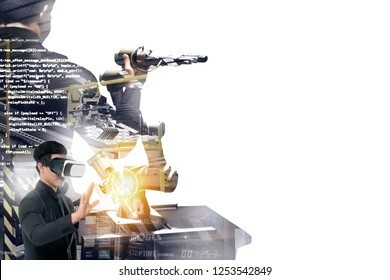 Smart precision health care , artificial intelligence technology and glasses augmented reality technology concept. 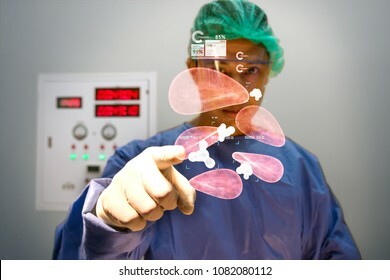 Surgery doctors point finger see red blood cell hologram data from popup AR screen. 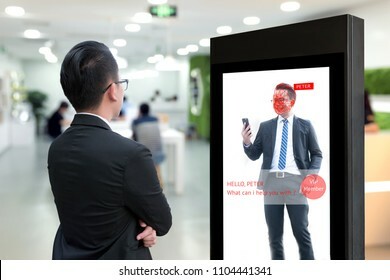 Intelligent Digital Signage , Augmented reality marketing and face recognition detect vip member concept. Interactive artificial intelligence digital advertisement in co working space. 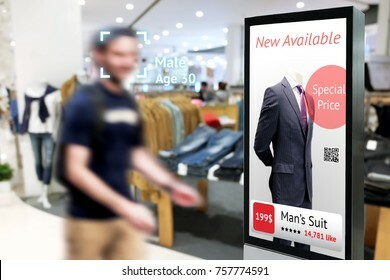 Intelligent Digital Signage in smart retail , Augmented reality marketing and face recognition concept. 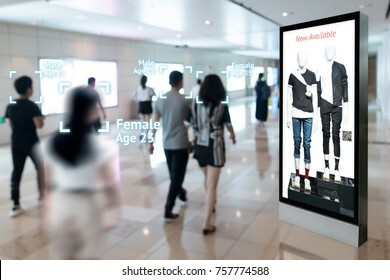 Interactive artificial intelligence digital advertisement in fashion retail shopping Mall. 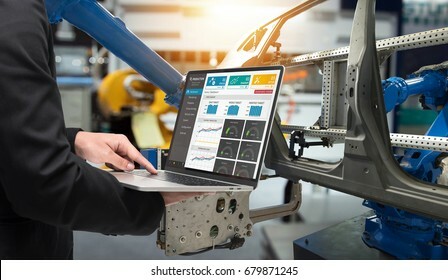 Digital transformation of internet of things (iot) technology disruption in world industrial to industry 4.0 concept. Graphic of Automated robot machine graphic , gears connect.